Tomorrow is the big day, or should I say tomorrow is the small day. Tuesday March 12th is the first day of Mommy Mayor Bloomberg’s large sugared drink ban. According to the new rule.. city restaurants, street vendors and movie theaters can no longer sell oda and other sweetened drinks in containers larger than 16 ounces. According to the mayor its OK because we are all a bunch of idiots…who can’t understand portion control. In reality it is not portion control, it is a soda tax. Because people who want more than 16 ounces of soda at a movie theater will purchase two, which will cost them more money. But Bloomberg, who believes in Abortion because government shouldn’t interfere with a woman’s body…is trying to control what we all put in out bodies. 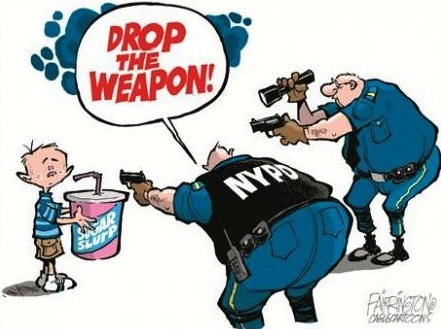 Bloomberg said residents of the city can still have as much soda as they want, just not in the big containers. probably not come back for the second, but it’s totally your choice. manufacturer and soft drink manufacturer, they have portion control. Oh so the nation’s poor are too stupid to understand being overweight?